Our beds will make your dreams come true. You need just two things in life, a good mattress and a good pair of shoes as you are either in one or the other. 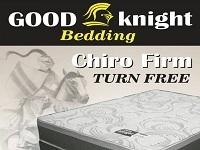 Good Knight Bedding delivers a quality product directly from the factory to the consumer, on a national basis, at the best price.